Lovely Vacation Condominium in Whitefish... Affordable! Enjoy the awesome wonder of Northwest Montana at our quiet mountain resort, beautifully situated on 52 forested acres. Experience skiing at Big Mountain, offering over 4,000 acres of challenging slopes and trails, and an annual snow fall of 335 inches. In summer, the hiking is fabulous. The valley is a world-class golf destination with courses surrounded by forests, lakes, and mountains. Our resort offers indoor and outdoor pools, tennis courts, kids' fishing pond, and playground. The beautiful village of Whitefish is only ten minutes away, and the distance to the unparalleled scenery of Glacier National Park is only 30 miles. We are retired and love to travel. 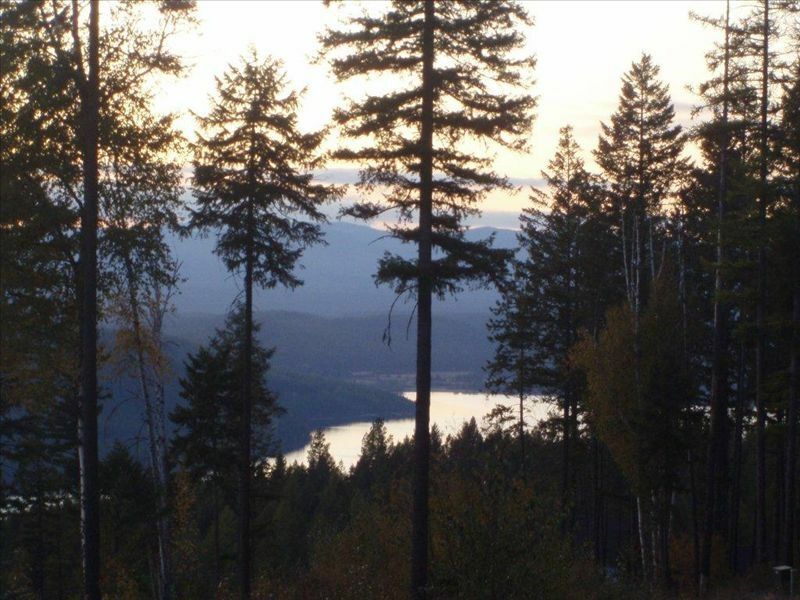 We have always loved Whitefish and the area surrounding the friendly town. Good galleries, restaurants and changing holiday features. Seems to be a great place to relax. Because the area is outstanding and beautiful and the people are very friendly. Main floor bathroom, tub, shower, toilet and small room set off by door to toilet, Garden level bathroom, shower that has the sink, toilet and mirror, etc. Long distance not available. Need to use a long distance card. Each floor has it own heating devices. Thermostat on main level that cover main floor and loft. Bathrooms have their own electric heaters as do the garden level bedrooms. Laundry facilities on campus not in unit. Only a short drive on the campus. For bathrooms and kitchen NOT swimming pools. Will need to bring your own big towels. Small salt and pepper to be replaced by renter when used up. Full kitchen (dishes, pots and pans, microwave, stove/overn, toaster oven, flatware, cooking utinsils, etc). The dining area is shared with the living room. Fantastic place nestled right between the hill and town. Great location, and lots of space for families and groups in this unique two level condo with loft. The decor suits the mountain feel, and the large hot tub area is perfect for Aprés relaxation. The owners are fanatastic, and quick for responses if you need anything. Carter, thanks for the excellent review. Do come back again!! The location, hot tub, and pool were wonderful, but the condo is a little too cozy. It is advertised to sleep 8, but in reality, it shouldn’t be more than six. The small living room with the hide a bed is not remotely functional if the bed is folded down. The worst part though was the cedar beetle problem. The condo wasn’t vacuumed before our stay and we walked into dead beetle and fly remains on the floors and surfaces, but we swept up what we could and carried on with our holiday. The live beetles crawling across the wall though was the really unsettling part. Other than that, the neighbours were friendly and the condo had all the basic necessities. Built on a mountain so multiple levels so anyone with difficulties with steep stairs should probably stay away. It was beautiful there! We really enjoyed the indoor pool and outdoor hot tub and sauna. We should have tried outdoor pool...so close but we do enjoy a hot tub. (2 different locations). Place is nice with two bathrooms and we actually didn’t use most of rooms because we invited our adult children but they declined. Although there is a private beach...which we tried once..,,we found the city beach much nicer and easy to get to. (No codes and is sand not rocks). The restaurants in Whitefish have very big portions. If we both had our own meal...Always had leftovers. I would very much recommend this condo! Thank you for your kind review. We were happy to hear that you enjoyed yourselves and took advantage of things around Ptarmigan, Whitefish and other areas. Overall very good experience, perfect for two families. So happy you had a good experience and enjoyed Whitefish and our condo. We loved our stay here. The temp was mid 90s during our stay and the basement which slept 4 was still very nice and cool. We loved both the indoor and outdoor pool and the fact that it was so close to Big Mountain and the public beach. Thank you so much for staying in our condo and thank you for your positive response. We are planning some updating in 2019, so, if you plan another trip to Whitefish, think about Big Horn Unit #12. The condo was a comfortable, cozy place to stay in Whitefish for our family of 4. The condo was well-equipped with pots and pans, dishes, linens, etc. However, the kitchen was lacking in basic things like oil, sugar and foil (we bought those things and left them for future guests). There was salt and pepper but that was it. Access to washer/dryer was a short 5-minute drive away. Wifi worked fine. We enjoyed the outdoor pool, which was right next door, and also the private lakeside beach. We made a couple of trips to lovely GNP. Thank you so much for your review. We were happy to hear you had a good stay. We tried to leave saran wrap, aluminum foil and some spices but the cleaning staff clean out refrigerator and cupboards after each rental. Hopefully what you left was there for the family checking in on the 22nd of July. Again, thank you. We will be doing some renovations in early 2019. We look forward to your next visit. Seven nearby golf courses, Skiing, 78 marked runs, hiking and biking trails, heavily wooded area, small fishing pond on campus (no need for a license). 45 minutes driving to Glacier National Park where you can enjoy whitewater rafting, Middle Fork of the Flathead River for whitewater and float trips, horseback riding at Bar W Guest Ranch. For long-term rental: one month is US$2,025; two month is US$4,050 which works out to be US$67.50 per day.